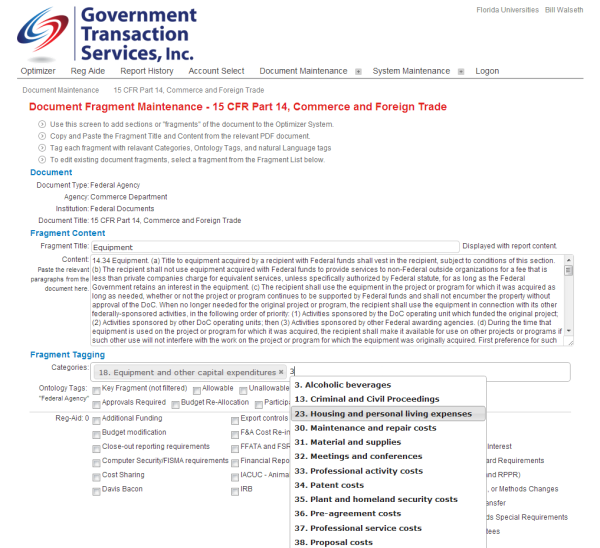 Government Transaction Services (GTS) uses the WCG Tag Library framework to categorize and tag complex regulatory documents. The resulting products allow GTS customers to rapidly locate relevant regulations, and avoid costly project audits. The Tag Library software splits documents into individual document fragments. Each document fragment can be individually categorized and tagged with keywords for retrieval. The Tab Library project contains detailed user account management to facilitate a wide variety of billing options, per report, or per user.